Viandes Dunham is a meat processor specializing in ready-to-cook prepared meats for hotels, restaurants and institutions. 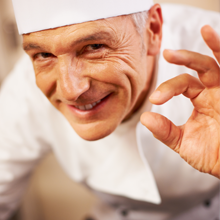 Our superior-quality products are standardized to meet the needs of the most discerning restaurant owners. These individually packaged, portion-controlled products are available through frozen food wholesalers. At Viandes Dunham, we believe that the company’s success is due in large part to our use of fresh ingredients and vegetable oil-based marinades, and the consistently high quality of our handmade products. To meet the growing demand for custom products at the forefront of taste, Viandes Dunham increased its operating surface from 5,000 to 15,000 sq.ft. in 2009, effectively enabling them to stand out from the crowd and to continue offering more varied products and services—a commitment they take very seriously. Viandes Dunham also strives to produce “healthy products” that meet the strictest food industry requirements. They have implemented the same quality standards for raw materials. During product development, the primary concerns are reducing sodium and fat levels, and eliminating allergens. Thanks to a strategic partnership, our famous homegrown Nagano pork products, originally developed for Japanese gourmets, come in a wide range of selected cuts, prepared and seasoned to perfection. This practical solution allows restaurants and hotel chains to serve exceptionally tender, juicy pieces of Nagano pork, prepared according to their specifications, without any of the fuss. Viandes Dunham also stands out from the competition for its guarantee of the highest possible standards of product consistency, quality and safety. In 2009, the company successfully implemented the HACCP program and received certification from the Canadian Food Inspection Agency (CFIA).